​-Custom music - I already have some .m64 files made. The problem is I can't apply them to my hack without the game crashing at the character select screen. They only work if I don't have custom karts files in there too. -(Optional) Fixing the sound bank so that the hack can run without the Expansion Pak and so that I can get a Wii/Dolphin Virtual Console Port made . This is awesome mate! Really love the look of Yoshi's Valley as well as the ghosts in Banshee Boardwalk! Very impressive! This looks like a great one!!! Here are some of the songs I've made. But for some reason I can't apply the music patch to a version of my hack with custom karts in it. I tried putting the music patch in first and then the karts and the game doesn't boot up at all. 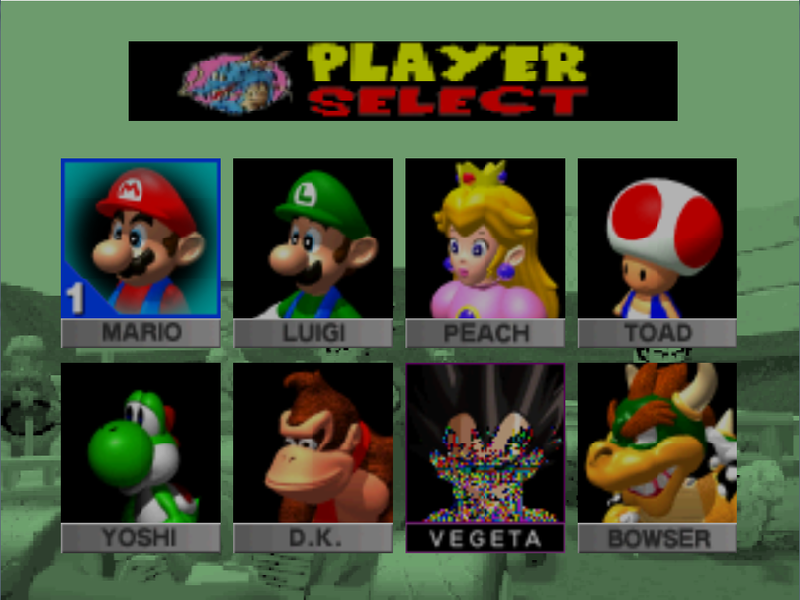 If I put in the karts first and then the music, the game crashes at the character select screen. I've also tried expanding the rom up to 64 MB and that doesn't work either. It is a great job in terms of setting some levels and sounds. The level Yoshi's valley and Jungle DK are brilliantly set. there are some levels I suppose for giving them an atmosphere that goes more with Dragon Ball. What I recommend is to use the Zouzzz tool and modify the skills of the characters to give their own personal touch to the mod. First of all this is great because I just watched the SaiyaPeople video. I guess it is a music that we would have great in other games like GE or PD. by the way I do not know where the music patch is downloaded or to be able to hear the music of the mod. I am not an expert but I think that no solution has been found yet and we do not even know the reason why a modification to the game and a modification of the music can not work together in the same rom. I think that there is still a lot of progress to be discovered in the modding of MK64. There are Mario Kart romhacks such as Vinesauce Kart or Kekcroc 64 out there with both custom characters and custom music, so I know it's possible with the current modding tools. I just thought that maybe there's something I could've overlooked when putting the mod together, like if there's a strict order you need to do things to get everything to work. I know it has nothing to do with the size of my karts or m64 files because I tried just making a rom with no changes except for 1 custom character and just applying the music patch without any songs made it crash the emulator. So I thought I could just replace the blue highlighted values on the left with the ones on the right, but when I did that I get this "Emulation stuck on a permanent loop" error when I try to open the new rom with the hex changes. I'm probably doing the hex editing thing completely wrong, but I assume these values are why the game crashes when I have both custom music and custom karts. (13-01-2018, 01:08 AM)SaiyaPeople Wrote: So I thought I could just replace the blue highlighted values on the left with the ones on the right, but when I did that I get this "Emulation stuck on a permanent loop" error when I try to open the new rom with the hex changes. I'm probably doing the hex editing thing completely wrong, but I assume these values are why the game crashes when I have both custom music and custom karts. The values at offsets 0x10 and 0x14 in the N64 ROM header are the checksum values. These values are a custom checksum run by the boot code over the first 1MB of the ROM, so if anything there changes, these values also must be updated. The boot code validates the two checksum values and if they are incorrect, the boot code will infinite loop (and some emulators will provide a nice message). Well I managed to get a version of the hack running with custom music and 1 custom character. But the character select icon is glitchy, the game crashes if you stay on the character select screen for more than a second, and the game crashes if you choose the custom character. But the character does appear as a CPU normally in Grand Prix mode, so I think I'm getting somewhere. Is there an archive where I can download older versions of Pitstop? I've tried this on 0.0.5.2, 0.0.5.1, and 0.0.5.0 and I get the same results on all of them when I try custom music with custom characters. The hacks that I've seen with both working were clearly made before 5.0. So I believe that whatever changes were made in recent versions to fix the game crashing at the Battle/VS mode results screen somehow broke compatibility between custom characters and custom music. (16-01-2018, 06:29 AM)SaiyaPeople Wrote: Well I managed to get a version of the hack running with custom music and 1 custom character. But the character select icon is glitchy, the game crashes if you stay on the character select screen for more than a second, and the game crashes if you choose the custom character. But the character does appear as a CPU normally in Grand Prix mode, so I think I'm getting somewhere. First of all, I like the mod that you made.